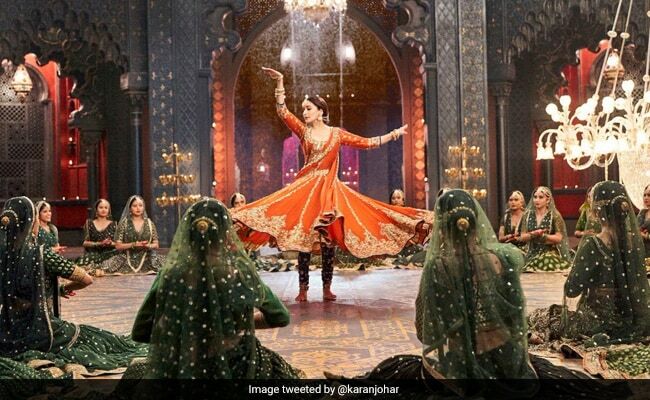 There's good news for those who can't wait to see Madhuri Dixit's kathak moves on the Kalank dance floor. A brand new song titled Tabah Ho Gaye, picturised on Madhuri Dixit, is releasing tomorrow. Karan Johar, who shared a glimpse of the song on Instagram, also added a heartfelt note for Madhuri Dixit, saying she made Kalank "special" for him. "It has been an honour knowing and working with Madhuri Dixit. Kalank will be special to me for various reasons but one of the most special reasons was that it was our - Dharma Productions - first major collaboration with Madhuri... her song will be released tomorrow, Tabah Ho Gaye, and I can't wait to share it with all the Madhuri fans worldwide... me being a big fan myself! Watch this space guys." It has been an honour knowing and working with @madhuridixitnene #kalank will be special to me for various reasons but one of the most special reasons was that it was our @dharmamovies first major collaboration with Madhuri ....her song will be released tomorrow #tabahhogaye and I can't wait to share it with all the Madhuri fans worldwide ...me being a big fan myself! Watch this space guys....day after the 9th of April the song will be yours! Meanwhile, Alia Bhatt, who co-stars with Madhuri in the film, listed Tabah Ho Gaye as one of her "favourite" songs from the Kalank playlist: "One of my favourite songs in the album... for obvious reasons! Tabah Ho Gaye is out tomorrow." In Kalank, Madhuri Dixit features in the role that Sridevi was originally cast in. Madhuri was roped in after Sridevi's death last year. In an emotional note last year, Janhvi Kapoor wrote Sridevi's family is "thankful" to Madhuri for taking up the role. Speaking to IANS recently, Janhvi revealed what it was like to see Madhuri in Sridevi's spot in Kalank: "I was excited to see her in Kalank from the audience's point of view. I think the teaser of Kalank and every character's look in the film, is look really beautiful. So, I am really excited to see that film." Directed by Abhishek Varman, Kalank also stars Varun Dhawan, Sonakshi Sinha, Aditya Roy Kapur and Sanjay Dutt. Kalank hits screens on April 17.